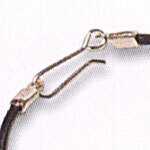 Leather crimps are used on the end of leather cords and other thick stringing materials. They have a loops at one end for connecting to a fastener like a clasp. Some of them have spiral (ie springs) for their bodies - these are called spring ends. Others have "flaps" that fold over the thong. You need pliers to them over the thong. Here we will be showing how to use the latter kind of crimp connectors. 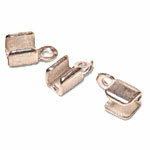 Remember that the crimp will add some length to your finished jewelry. After threading on the beads etc. that you want for your design, place one end of the thong into the end cord connector. 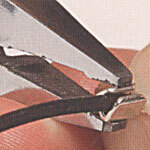 Use a blunt-nose plier to fold down one side of the crimp over the thong, then the other side. Ensure that the crimp is tightly over the thong and it will not slip out. Tighten over the cord just enough to prevent slippage but not enough to deform the cord or break the crimp. Repeat the same process at the other end of your cord jewellery. 2) Add a jump ring, split ring, or some form of hook to one crimp at one end. You can add a fasterner/clasp to the other end via a jump/split ring.